What is Training Mode? – How can we help? Training mode is an option available for Vend on Mac and PC that allows you to try out Vend without affecting any of your store data. This is a useful feature if you want to train new staff or try out new features as all sales processed in Training Mode will not be recorded or synced to Vend. Note: When Training Mode is active you will not be able to access the sales history, status page or settings. You will also not be able to email receipts, discard or park sales, quick add new customers or close the register when training mode is switched on. To activate training mode, click on the register/outlet name in the top left of the sell screen and click Switch to Training Mode. When Training Mode is active, you'll see this blue top bar. You can now search for customers and products and process dummy sales without it affecting any actual store data. You also have the option to enable or disable tutorial mode by clicking on the switch next to 'enable tutorial'. When this is active (green), prompts will appear to take you through the selling process. 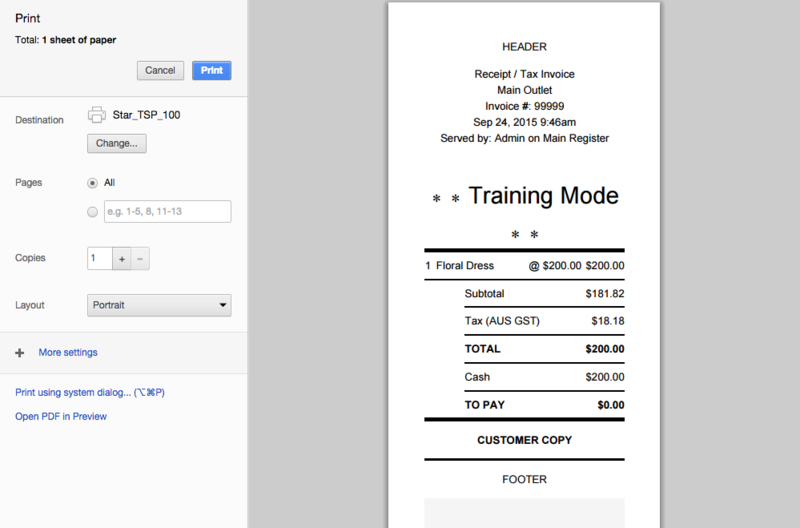 If you print a receipt while Training Mode is active, 'Training Mode' will be displayed on the print out, so people know this is not a real receipt. Important: Do not process any real sales while in training mode, sales made when training mode is active are not recorded. To exit Training Mode, click the 'Exit Training Mode' button on the top right-hand side of the screen. Important: After exiting Training Mode confirm that the blue bar has disappeared before processing any real sales. If any sales are processed while Training Mode is still active, they will be treated as dummy sales and will not be recorded or synced to your store data.